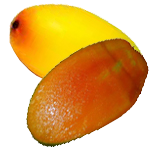 Chausa mango is known as the Emperor of Mangoes. A Box of Fresh Premium Chausa mangoes picked from the Top Mango regions of the world. The “Emperor of Mangoes” Chausa is considered one of the most delighful and juicy varieties of mango. It is sweet as honey when ripe and beats any mango is sweetness. 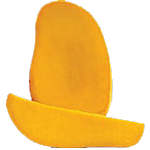 The best of Chausa mangoes are grown in the Multan region of Pakistan and in the Saharanpur-Malihabad belt of India. 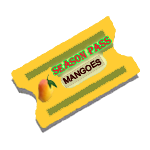 A Large Box contains 6-12 premium Chausa Mangoes (dependng upon the size of the fruit). Our Chausa mangoes come from the premium mango growing regions of Pakistan and India where the soil and weather is just perfect for the fruit. Chausa SB (Samar Bahisht) is one of the sweetest mango that exists. Most of the seasons, the BRIX index (measurement of sweetness) of the Chausa mango is the highest of all the mangoes that we import. Chausa mango turns yellow when ripe with a whitish yellow flesh. It’s growing season is from the end of June to the middle of August. Chausa comes after most of the regular varieties- but when the Chausa is in season it eclipses everything else.